In March 2018, Gino’s Panel and Paint hosted a live demonstration in their South Fremantle workshop, to showcase to the WA panel beating industry new painting and curing applications from Sikkens and Tesla Cure. Perth panel beaters understand the importance of new technologies to increase speed and efficiency, while maintaining low energy consumption, as these are crucial aspects of delivering a quality and cost-effective service. 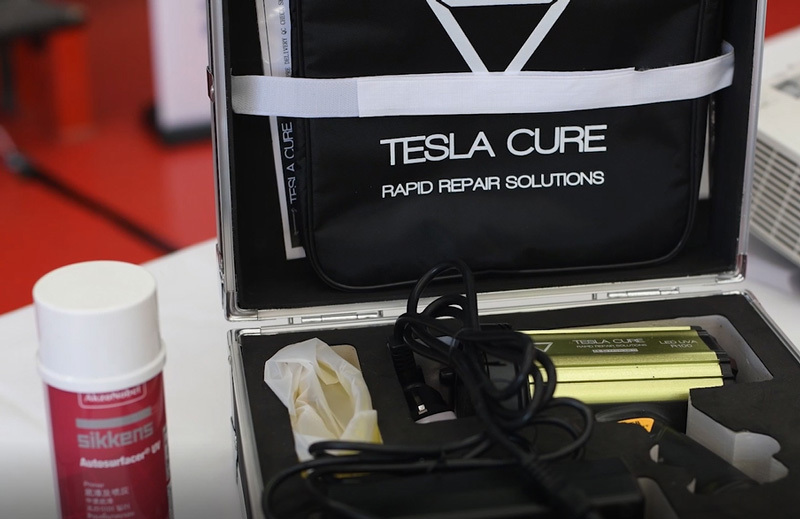 AkzoNobel’s Katia Gridina hosted the demonstration event of what is now known as the world’s fastest rapid repair process, showcasing the TeslaCure R100 with Sikkens Autosurfacer UV primer. For over a year the AkzoNobel research and development team have been testing and field trialling the latest technology in cured coatings with TeslaCure. Sikken’s vehicle refinishes, a brand of AkzoNobel, develops innovative coatings and services for collision repairers and commercial vehicle refinishers. TeslaCure provide UV curing equipment for body and paint repairs. The combination of the Sikkens Autosurfacer UV primer and the TeslaCure R100 lamp has been globally recognised as the fastest combination of product and UV curing. Although the TeslaCure lamp can work with other paint products, the fastest results were obtained in combination with Sikkens Autosurfacer UV primer. This primer is ready to use and has an unlimited pot life, and saves time while achieving amazing results. Previously, vehicles had to be air dried (creating massive bottlenecks) or technicians had to use conventional UV mercury lamps (which run at high temperature, use high wattage, are slow to warm up and globes need replacing every 500 hours). Panel beaters can now use the TeslaCure R100 with a lamp life of 20,000 hours – never needing to replace a globe and it is extremely energy efficient as it only uses 2,000 watts of energy to a 1 square metre area. These products enable panel beaters to work more efficiently and cut down on labour and energy cost, and only requires 30-120 seconds of UV-A LED exposure to fully cure, and can be sanded directly after curing. Luke Coupar, a technical specialist from Sikkens, demonstrated to the WA panel beating industry on how these new products can reduce wait times and increase efficiency with a live walk-through of the process. Attendees of the live demonstration had the chance to rub, sand and feel the cured guards as they went through each step of the process, discussing and comparing techniques as they went. Aaron Scagliotta, director of Gino’s Panel and Paint, shared his experience and the positive impact that Sikkens and AkzoNobel’s innovative products and technology have had on his own operations. “This latest technology has ensured our panel beaters can increase their efficiency without losing the high standard of result we are used to” he said. The introduction of this new process and user-friendly equipment will ensure that Gino’s Panel and Paint continue to lead the way with their rapid repair process. Lower energy costs, no waste and faster process times help lower turn-around time and cost to the customer – meaning a win-win all round! Gino’s Panel and Paint are proud to be the first WA auto body shop to embrace this technology and share their experience with the industry. Attendees found the live demonstration extremely informative, and a lucky door prize recipient won the Sikkens Autosurfacer UV primer and a TeslaCure Lamp for their own! Read more about the Sikkens Tesla Cure information night.